In general, it’s a paper (waste paper) soaked with asphalt which makes them waterproof. Paper is then top coated with asphalt layer and sprinkled with ceramic granules as a final protection layer. Some of the asphalt shingles types are algae-resistant, they have a percentage of their granules replaced with leachable, ceramic coated copper, which is designed to prevent algae staining. However, this will not prevent moss from growing, it may just slow it down. Because moss likes to feed on algae and any debris on the roof that preserves moisture – keep your roof surface clean and remember about the roof maintenance. Most manufactures provide a five to ten year warranty against roof shingles algae growth; 3M (scotchgard TM) supplies a twenty year warranty. 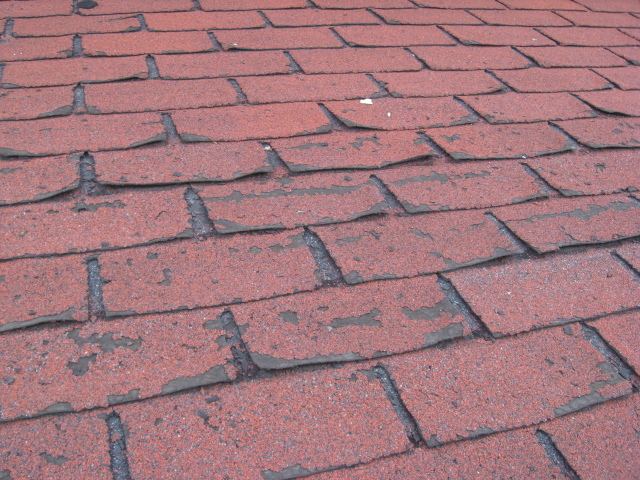 Organic shingles consist of close to 40% extra asphalt per square (100 sq feet.) as compared to fiberglass shingles. However, this additional required asphalt means that they are less eco-friendly (regardless of its “organic” name). The paper-based character of “organic” shingles makes them more vulnerable to fire destruction. Shingle strength is ranked by their warranty, which ranges from twenty years to fifty years; sometimes lifetime warranties are offered. They use a glass fiber reinforcing mat as a first layer. The mat is constructed out of wet, randomly-laid fiberglass bonded together with urea-formaldehyde resin. It is then covered with asphalt containing mineral fillers which make the fiberglass shingle water-proof. Fiberglass shingles generally have a class “A” fire rating because the fiberglass mat resists fire much better than organic/paper mats. The asphalt shingles are very economical and multipurpose, work very well on steep and sloped roofs (they should only be used on roof slopes of two units vertical in 12 units horizontal – 17% slope or greater). Asphalt shingles are sunlight and weather resistant, they need minimum to no maintenance, and are much cheaper than other roofing materials. Additionally, asphalt shingles are easy to cut, secure, and fit around the roof penetrations, they are also compatible with various types of flashing and edging materials. Asphalt shingles now come in many kinds of colors and profiles, and may be coated with special laminate to enhance their appearance. Although, adding some of the features may increase the price of your roof, asphalt shingles are still going to be the most affordable and high quality roofing option. 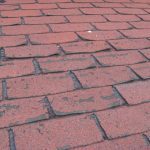 Click this link – replacement roof cost – to calculate approximate price for a new Illinois asphalt shingle roof and receive 10% OFF. Illinois Asphalt Shingle Roof – How durable asphalt shingles are? Thermal shock is what asphalt roofing materials experience during significant temperature changes that occur within a very short time period. 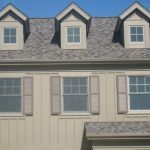 An additional element which affects asphalt shingle roofs is attic ventilation – correctly installed, significantly extends the service life expectancy of your Illinois asphalt shingle roof covered home.